Increased capacity to 400 pounds with the same precision and repeatability that makes our products great! Overview: The EatSmart Bathroom Scale is the ideal way to track your weight loss quickly and easily. Simply step on, and in seconds you’ll have an accurate readout to the nearest .2 pounds on the EatSmart’s oversized 3.5″ Accubright LCD display. With EatSmart’s proprietary new ‘step-on’ technology there is no more tapping to turn the scale on!!! The LCD display also contains a cool-blue backlight, allowing for easy viewing even in the most low light areas of the bathroom or home. 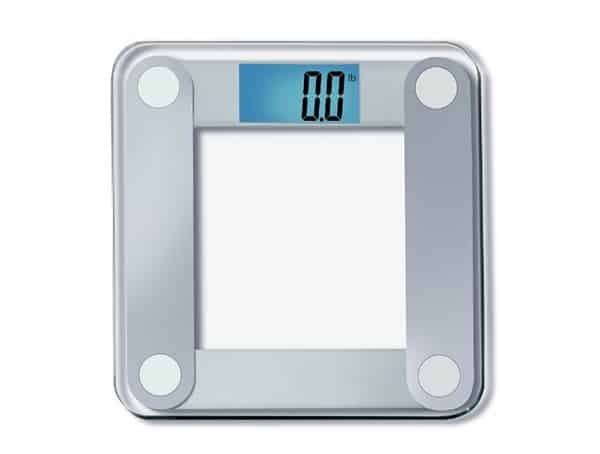 The EatSmart Digital Bathroom Scale is also not only easy to use but also extremely accurate, engineered to the highest precision standards. The four high-gauge EatSmart Precision sensors ensure that you will get an accurate measurement every time down to the nearest .2 lbs / .1 kg. Additionally the slim, tempered glass design fits perfectly into any surroundings and large non-slip platform safely allows weights to 400 lbs. Along with your EatSmart digital scale you also receive our easy to read instruction guide and 4 AAA batteries. Everything you need to weigh yourself right away! Along with your scale you will also receive a EatSmart Body Tape Measure. Measure any body part – waist’ biceps’ thigh’ calf’ chest quickly and easily to track progress! EatSmart Guarantee: 100% EatSmart Guaranteed Product Satisfaction. • Updated EatSmart Auto-On Technology and Sensor Accuracy. Best selling scale on Amazon 7 years running. Best in class customer service and support from a trusted vendor! • Large 3.5″ LCD display w/ Accubright blue backlight – Easy to read from any distance or angle! • Free EatSmart Body Tape Measure now included – Another great tool to monitor progress! • Auto Calibrated; Auto Power-Off; Runs on 4 AAA batteries (included); 100% EatSmart Satisfaction Guarantee – Buy with Confidence!